Note: Due to the age of the vehicle, CJ's can have previously unknown fitment issues. Most times all will be fine, but we never know until you try to bolt them on. 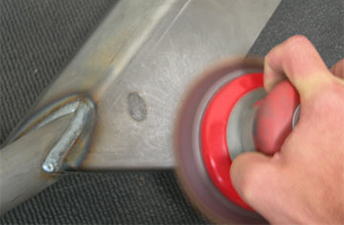 Our products are designed for the best possible fitment, but, tubs may vary with age. Note: If you have a CJ-5 between 1972 - 1975 You may experience fitment issues. The mounting plate overlaps, but does not cover or close off the "notch" at the top rail of the tub. Feel free to Contact Us, if you have questions or need clarification. 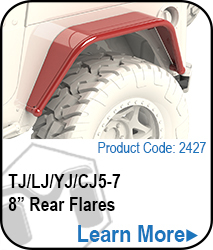 Rear Flare Mounting Plates, designed to mount the Quick Release Flares and cut for bigger tires. NOTE: Mounting plates for CJ's 1972 and later. CJ's tubs vary by model and will not all fit the same. 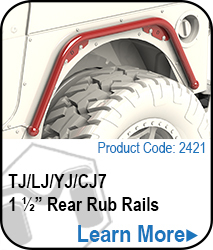 CJ5 Owners, Mounting Plate will cover but not close off the notorious "notch" at the top of the tub. Mod Cut requires a small cut of the tube from behind and in front of the tire. Body Mod Base Plate trumps the Stock Plastic Flares. 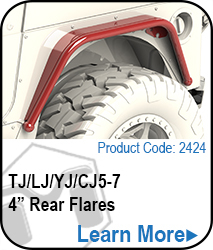 Mod-Cut Mounting Plate allows for plenty of room for 35s on CJ-7 with a 2" body lift.